According to the Bank of England almost 900,000 people moved from one job to another between October and December 2017. This is the highest number since 2004. The UK population has grown since then but, even as a share of the overall workforce, it is the largest proportion since 2007. So job movement is back to pre crisis levels. It comes as unemployment has fallen to 4.3%, its lowest level since the Seventies, and employment has risen to a record high. For over 10 years, organisations have seen a workforce with high levels of "comfortable disengagement" with employees treading water, reticent to take the leap and change jobs. This lack of engagement has suppressed attrition but has also stifled productivity . Has the bubble now burst and are the floodgates about to open with candidates now ready to take the risk and move jobs with the confidence that if things don't work out there is another job just around the corner? Now more than ever it's important to define your employee value proposition - to help you attract the talent you need to drive your business forward, but critically to ensure you connect with the talent already in the organisation you don't want to and can't afford to lose to the competition. Now that the race has moved from a leisurely jog to a sprint, make sure you're not left behind. The UK labour market is tightening. 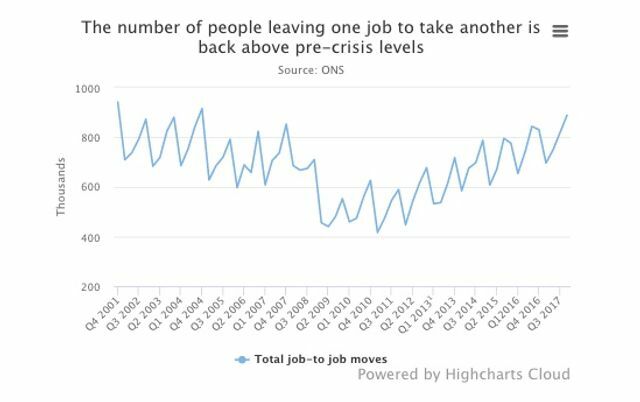 #ONS Labour Market Flows data show that on a trend basis the number of people resigning from one job to move to another is at its highest level since 2001. Lower unemployment; rising number of job vacancies emboldened people to change jobs?